The unit comes with a 1/2 H.P. electric motor, 115/208-230V, 5.4 AMPS 60 cycle single phase. We use Torrington Needle Bearings and hardened steel components throughout, 62 Rockwell. This unit features outboard shafts to produce three auxiliary profiles, not offered by other manufacturers. 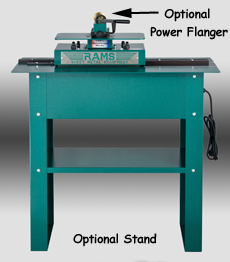 The cabinet and optional stand are heavy gauge steel with a Hammertone Green Finish.